I ran into Ricardo Dos Santos and his amazing Qualcomm Venture Fest a few years ago and was astonished with its breath and depth. From that day on, when I got asked about which corporate innovation program had the best process for idea selection, I started my list with Qualcomm. This is Ricardo’s “post mortem” account of the life and death of a corporate entrepreneurship program. Part 1 outlining the program is here. Part 2 describing the challenges and “lessons learned” will follow. In 2006, as a new employee of the Fortune 100 provider of wireless technology and services, San Diego’s Qualcomm, I volunteered to salvage a fledging idea management system (fancy term for an online suggestion box) by turning into a comprehensive corporate entrepreneurship program. 1. The program had to remain fully open to employees from all divisions. 2. The ideas were to be implemented by existing business or R&D units – i.e., no need to create new permanent infrastructures for innovation. And he added a third goal that would ensure his greater involvement and support going forward. 3. The program had to have an efficient mechanism to bubble-up the best ideas (and their champions) to the timely attention of the top executive team. Teach participants on how to turn their ideas into fundable experiments. Educate employees who submit ideas that in corporations, there is no magic innovation leprechaun at the end of the rainbow that turn their unsolicited suggestions into pots of gold – they themselves had to take ownership and fight for their ideas. All while keeping in mind that employees, managers and executives have day jobs – so how could we ask them to spend significant time on new ideas while not sacrificing their present obligations? Thus began our search for a program that would properly balance the focus on the present with the need to increase our options for the future. In 2006 we searched outside of Qualcomm for other similar entrepreneurship programs where participants also had to balance other obligations. We realized this mechanism had been occurring for years at University’s startup competitions, such as the MIT 100K Accelerate Contest. In these competitions, multidisciplinary self-forming teams of students work part time to pitch new companies. The program we implemented inside of Qualcomm ended up being very similar. 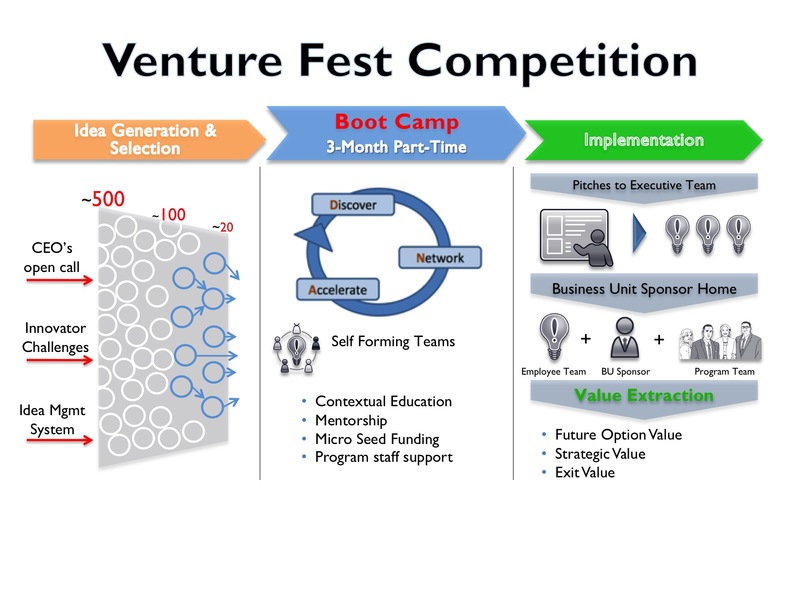 We dubbed the program Qualcomm’s Venture Fest and the process, “Collective Entrepreneurship”, a three-phase program combining crowdsourcing with entrepreneurial techniques for startup creation. The first phase of the program leveraged the idea management system to collect a large number of competing entries then ultimately down-selected to the top 10-20 concepts with the most breakthrough potential, according to peer and expert reviews. The second phase, and heart of the program, was a three-month, part time bootcamp that would prepare idea champions for the internal funding battle that followed. The bootcamp requested that participants do what entrepreneurs do before requesting seed funding – Discover, Network and Accelerate. (In hindsight we were having our employees get out of the building to talk to customers, build prototypes and generate partner interest – essentially doing Customer Discovery years before Steve Blank taught his Lean LaunchPad class at Stanford and the National Science Foundation!). Our employees faced the typical impediments to corporate entrepreneurship – lack of employee time, skills, connections, pre-seed money, and official sources to discuss and manage the risk/rewards tradeoffs of sticking your neck-out. So our program staff built a support system of contextual education, mentorship, micro-funding, and hands-on coaching. Finally, the third phase of the program, implementation, began with the top team’s pitches to the C-level executive team, which determined the competition winners, prize money and directed other promising teams to target business unit sponsors. Our program staff facilitated the handoff and disseminated the value extracted from any funded experiments, including future option, strategic and exit value. 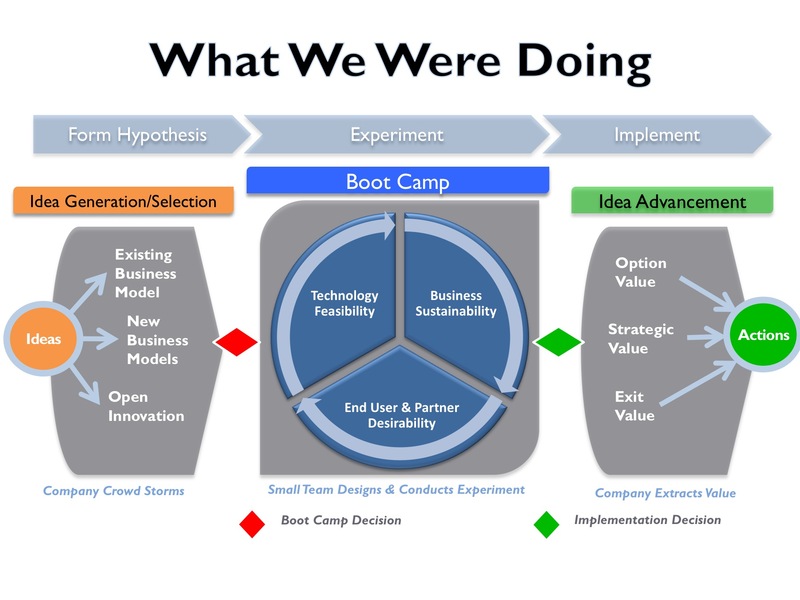 In retrospect we designed something akin to a startup accelerator, the Lean LaunchPad classes or the National Science Foundation’s Innovation Corps, although none of these existed in 2006. We had C-level support. The CEO of the company embraced the program and supported the process, especially since it brought novel and thought provoking ideas to his executive team’s attention. The program steadily generated healthy interest from Qualcomm employees – submissions grew from 82 in the first year to over 500 in its fifth and final year. Several ideas were fully or partially implemented, (with hundreds of millions of USD invested), with a couple of genuine breakthrough successes, and hundreds of related patents were filed. Employees reported noticeable gains in entrepreneurial skills and attitude, and the CEO seemed happy with how his baby was being raised. Part 2, challenges and lessons learned, to follow in my next post. This entrepreneurship program has processes that are part of the fourth generation (4G) of innovation theory and practice that has been developed over the last several decades since the 1970’s. However, 4G theory and practice includes much more than entrepreneurship and is integrated into R&D, strategic planning, marketing, finance and operations rather than treating entrepreneurship as a separate activity. 4G R&D was published in a book, Fourth Generation R&D, in 1998. The core twelve principles and practices of 4G were first published in a peer reviewed paper in the Industrial Research Institute’s journal, RTM, in 2001 and in an invited chapter on the generations of R&D and innovation management in the Wiley Encyclopedia of Technology and Innovation Management in 2010. 4G was first applied in 1978 with open innovation to create a capability, Whitesmiths, which was the first supplier of the tools and components for modern software engineering. I was fortunate to have had the opportunity of working with Ricardo and his team, promoting and supporting Venturefest in Europe. It was a great experience and Ricardo worked hard to make it truly inclusive – sometimes these schemes look great on paper, but the reality is disappointing. In this case the enthusiasm was captivating, and the opportunity for teams to develop interesting ideas and learn new skills was very real. A great program, brilliantly led by Ricardo – good times. Looking forward to part 2.